Card Text Play: Steal 1 . Then, steal 1 for each copy of Routine Job in your discard pile. If I play a copy of Routine Job. does that copy count as in my discard pile when I resolve it? No. Action cards enter the discard pile only after they have been fully resolved. 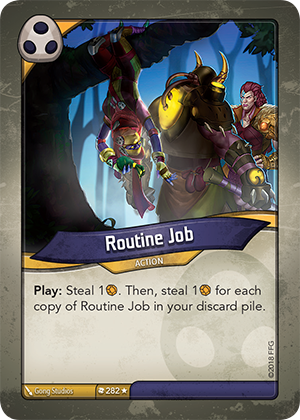 Therefore, the copy of Routine Job you just played is not in the discard pile when “steal 1 Æmber for each copy of Routine Job in your discard pile” triggers.